Here is a scrapbook worthy of the memories held inside it. 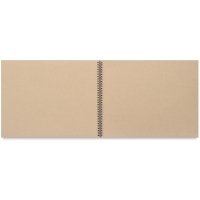 It features archival-quality 85 pt kraft covers filled with 20 sheets of thick, beautiful, oatmeal-colored paper. The paper is acid-free, fade-resistant, archival, and able to be marked, stamped, or embellished on both sides without bleed-through. 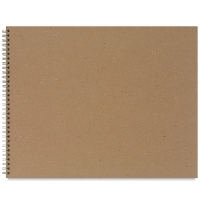 The double spiral binding allows the book to lie completely flat on your table or work surface. It measures 11" × 14" (28 cm × 36 cm) overall and is made in the USA.